To what extent can restoring native riparian plant coverage affect the health of Turkey Run tributary? The paper outlines the problems with the health of Turkey Run tributary and the ways in which one could rehabilitate certain sites along the bank to improve the health of the stream. Over time, the health of Turkey Run has decreased so it is imperative to restore the stream to a decent stream rating. 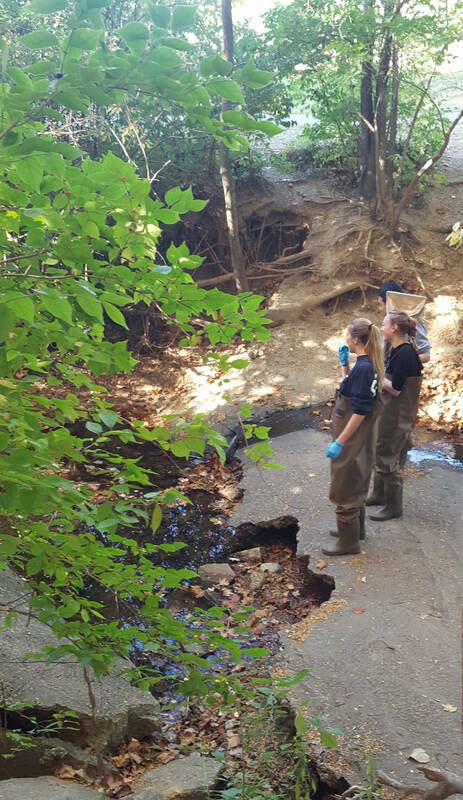 The text refers to different conservation sites which outline the parameters for maximum health of suburban streams as well as data taken by different AP Environmental classes to assess the current state of Turkey Run. sampling near an abandoned dam. Over time across central Ohio, the degradation of urban waterways in the lower Olentangy watershed have been studied in order to assess the quality and provide rehabilitation. Within the 88.5 mile span of the Olentangy watershed, there are four subsheds, the lowest feeding into urban Columbus and providing water for a population of 99,000 people. As the city and population has been growing, pollution from point and nonpoint sources and human impact have created less than ideal living conditions for some of the more selective macroinvertebrates and other gilled organisms. One of the smaller tributaries, called Turkey Run, flows through Upper Arlington and in most sites is severely depleted of organisms and healthy water. Turkey Run is a tributary which originates from stormwater drainage beside Henderson Road in Upper Arlington, Ohio. It runs from North to South and then bends East until it joins in with the Olentangy River. Given that it runs through a suburban area, some of the largest issues include nonpoint source pollution from fertilizers and people are tempted to redirect streams to prevent flooding (which channelization actually worsens the risk). Often times, people also mow their lawns or the areas leading up to the stream, called the riparian zone, which in a healthy stream is home to many deep-rooted native plants that prevent erosion and soak up nutrients and toxins. The riparian zone is one of the most important parts of a healthy stream system. Native plants with deep roots, sporadic larger trees for shade, as well as a smaller amount of channelization are some of the physical characteristics of a healthy stream. In the case of Turkey Run, certain sites differ in the severity of the physical and chemical conditions. Behind Upper Arlington’s Fire Station, the stream from the edge of the riparian zone down to the base is about 6-8 feet deep (The water is not as deep, only ranging from about .5 to 2 feet deep) and exposes plant roots due to extreme erosion. The riparian zone is mowed to the edge, preventing natives from growing nearby and instead what is left is ridden with invasive honeysuckle. With this in mind, it is absolutely necessary that research be conducted to assess the current damage and move forward with a plan to rehabilitate the stream for the sake of a healthy watershed. Although the appearance of the stream was poor in some places, it was in better condition in others, which is why in restoration it would be crucial to select sites with the poorest quality stream index and most physical issues. The Clean Water Act of 1977 was established in order to protect our waterways and preserve “clean water for the American people.” (http://www.epa.gov/aboutepa/meaning-1977-clean-water-act, 1). The original Clean Water Act of 1972 set the general standard for wastewater and industrial discharge into streams, prohibiting it unless one has a permit. There were “more than seventy changes... made in the existing law,” all of which made the act relate to common people and not just big business. It is still difficult, however, to trace things such as nonpoint source pollution so it is important to educate people on how to protect and conserve the wildlife and nature around the city. Also with this in mind, the Clean Water Act sets the lowest possible standards to protect waterways, there is still damage that is done. The headwaters of Turkey Run tributary begin in northern Upper Arlington from stormwater drainage, and runs through and between residential and commercial areas. This, then, is the reason there are major problems with the health of the stream because the amount of runoff from nonpoint sources in the area is large. “Riparian zones help to prevent sediment, nitrogen, phosphorus, pesticides and other pollutants from reaching a stream,” so it is important to strengthen Turkey run with native plants (http://www.bae.ncsu.edu/programs/extension/wqg/sri/riparian5.pdf, 1). The biggest problem is the fact that the stream and the areas around the stream are not maintained, so there has been gradual degradation. Based on research done by the EPA, Turkey Run is not a very healthy stream. Both in 2001 and 2005, water quality tests were done to assess temperature, pH, dissolved oxygen content, dissolved solids, suspended solids, as well as levels of hard metals. Any figures that stood out as poor or very poor were underlined. The data in 2001 was not as extensive as that in 2005, because it only measured IBI (Index of Biological Integrity), ICI (macroinvertebrate communities), and QHEI (Qualitative Habitat Evaluation Index).Two of these data parameters were underlined as indicating very poor levels of macroinvertebrates and other organisms usually found in urban streams (http://www.epa.ohio.gov/portals/35/documents/OlentangyTSD.pdf, 17). In 2005 more research was collected but overall, none of the data collected was too extremely out of place besides the low dissolved oxygen levels and high amounts of aluminum. Despite the general lack of periodic data collection from Turkey Run, a lot can be told from these two data collections. In the future, however, there should be more frequent research conducted in order to assess the stream quality to be able to move forward with restoration as well as upkeep. The biggest problems with Turkey Run have to do with the development in Upper Arlington. Whether the stream is channelized to make room for more businesses and homes or there is excessive nutrients in the water as a result of fertilizers, this leads to unhealthy water conditions as well as major erosion which I noticed at the Fire Station site because on either side of the bank there are large roots exposed. Generally, “riparian buffers should range from 25 to 100 feet wide on each side of the stream.” Turkey Run is not a good representation of this general rule (2). As a result, this stream is seen as more of a hassle and eyesore than a healthy part of the environment. Restoration of Turkey Run is an essential step to creating a healthier watershed around central Ohio. Fixing the issue at the root allows for the most cost effective plan for the stream while also making better choices about preserving what little nature we are still able to have in these urban/suburban areas. “The benefits of healthy streams include clean water, reduced flooding, reduced streambank erosion, reduced river and reservoir sedimentation, and lowered infrastructure costs,” which is entirely a positive reaction, there is no downside besides possible cost which in this case would be funded by nonprofits or the EPA (http://soilandwater.ohiodnr.gov/water-conservation/stream-restoration#OVE, 1). It is absolutely necessary that along with the restoration of Turkey Run that some sort of education be involved with it as well to keep the problem from arising in the future. Not only should the restoration call for students and parents and any people in Upper Arlington to join and aid, but flyers should be passed out in neighborhood areas close to the stream and possibly even a few presentations at different schools in order to increase awareness. The most important first step in restoration is to establish a general width estimate for the buffer zones by finding the height of the floodplain, which would be the area around the bank where if the stream depth was multiplied by two the water and bank would meet. Based on research which would be conducted on the population densities of different plants, one can select what should be reestablished. If possible, it would also be important to erect some sort of boundaries such as a fence to prohibit people from mowing to the edge of the riparian zone, allowing for a diverse population of different plants to thrive. Depending on the soil makeup in different parts along Turkey Run, “the site may benefit from pre‑planting preparation, including lime and/or fertilizer, and disking or plowing.” (http://soilandwater.ohiodnr.gov/portals/soilwater/pdf/stream/stfs13.pdf , 4). This would allow for the best conditions for plant growth and softer loamy soil would be better than silty clay soil. Testing the soil content would be important for deciding if it is optimal for plant growth and determining if any nutrients are at higher levels than others. There is generally a larger concentration of clay or silty soils so it would be necessary to provide some loam and or more porous soil types to balance out soil types. Soil porosity is an important factor in riparian zones because the higher the porosity of soil there is a smaller chance that the stream will flood too much and damage surrounding areas. Lower porosity soils, however, are very good at holding nutrients which are necessary for plants, so it would be important to have a good mixture of soil to allow for plants to grow but not too many nutrients that it will cause issues for the stream. Another big issue with Turkey Run is the fact that in the areas close to businesses there is litter and some businesses refuse to aid in the upkeep of the stream. While some businesses have cooperated and done stream cleanups every month, some refuse to do anything including not mowing to the edge of the riparian zone. With rehabilitation of this stream, it is vital to have cooperation from businesses as well as the community at large. This could be done by preventing redirection of the stream and “removing vegetation,” such as invasive species (2). In order to assess the full impact of the lack of buffer zone along Turkey Run tributary, the area must be divided into quadrats and looked at for population density of certain plants. Depending on the results of testing, the initial question would be whether or not the area is overrun with invasive species such as honeysuckle. If it is, it would be removed immediately. Depending on the population of native plants in each quadrat, it can be decided how many should be planted there in order to maintain the health of the stream. If the stream’s health increases, the proof would be mostly seen with the chemical properties of the water, macroinvertebrate populations, and general appearance of the stream. Given that the native plants remove excess nutrients, one would expect to see a drop in nitrates as well as phosphates (http://ohioline.osu.edu/ls-fact/0001.html). Macroinvertebrate count would be much higher, and more would be found from the different categories of stream health. It would be a slow, gradual change but over time more and more should be seen. The general appearance of the stream would be better because the vegetation in the buffer zone would be much more lush, extreme erosion would be much less prevalent because sediments would no longer be quickly redistributed, and the roots of plants would no longer be visible because there would no longer be erosion. Six AP Environmental classes tested the quality of Turkey Run’s water both in the 2014-2015 and 2015-2016 school year, in which a class of about 20-25 people were divided into about 4-5 groups and spaced evenly at different points up and down the stream. Students tested for nitrates, phosphates, turbidity, salinity, etc. and found no major chemical issues besides a slightly higher level of nitrates. Depending on the site that was tested, some places there were only leeches but in others there were some macroinvertebrates and even in some cases some small darter fish. Some sites found higher nitrates most likely came from runoff and decomposition of dead leaves and small organisms which contributed to the poor water quality. The turbidity was low and the water was very clear, however there was not very healthy water flow partially because there was a man-made dam installed which prevents any large input of oxygen into the stream. Based on data taken from other points along Turkey Run, there was a general correlation between the stream’s flow rate and the turbidity. In the 2015 data, the Lane Road site had the highest nitrate levels of all of the areas tested and the highest phosphates were found at the site close to Ohio Health. The stream indexes ranged from area to area but there didn’t seem to be any one major chemical factor that contributed. The areas with the highest stream indexes (such as the Ohio Health site and Lane Road) had the highest number of macroinvertebrates and among those were some only found in areas with higher water quality. That being said, there could be many physical differences that attributed to the decent/poor macroinvertebrate population counts. A goal to set based on this data would be to repair the buffer zones and assess it’s impact on macroinvertebrates. Comparing the data from 2014 to 2015, there are some important differences to consider. At the lane road site, phosphate levels nearly quadrupled, while all other measurements such as pH and nitrate slightly decreased. For all sites the nitrate levels decreased slightly. Although it is an urban stream and it may be difficult to maintain the health of Turkey Run, getting the community involved with repairing the riparian zones is the first and most important step toward success. If certain people or businesses are not interested in the aid in cleanups and repairs, a group of people who are willing and able could aid in a cleanup every so often. There is currently an Environmental Club at Upper Arlington High School, so getting that club involved with cleanups and setting a precedent would aid in restoring Turkey Run to health. Other small things that could be done to rehabilitate Turkey Run tributary would be occasional cleanups, making flyers to hand out to homeowners that live beside the stream about how to help, and making sure a group of people come back at least every year to reassess whether or not the plants and projects have affected the stream’s health. If standards like these are not met, it would be probable that the stream would begin returning to it’s original state and the work done would be a waste in the long run. A tactful approach to solving the issue in the long run would be putting together a group of people who can survey homeowners that live along Turkey Run about if they have had problems with the stream, if they mow to the edge of the stream, and if they have paid any large amounts of money to fix something as a result of stream flooding or other damage. Based on results from the survey, research could be compiled as well as a plan for maintaining their section of the stream could be created so they could visually see how much money they would be saving as well as how they would be contributing to the health of Turkey Run. Based on this data, steps can be taken to rehabilitate certain points along Turkey Run. The main goal would be to in the end have much higher levels of dissolved oxygen as well as larger macroinvertebrate populations. The riparian zones would be strengthened by the removal of honeysuckle and reintroduction of natives in order to aid in removal of excessive levels of nutrients and hard metals, as well as providing shade and shelter for the stream and organisms that live in or around Turkey Run. People would be happy with this plan because not only is it cost effective in the long run but it is also a plan to beautify the community and restore some nature to an area where a lot of nature is disappearing to new buildings and commercial sites. As far as selecting native vegetation is concerned, it is important to incorporate those which thrive beside waterways,and more importantly pioneer species which originated in Ohio such as cottonwood, red maple, ash, dogwood, or sycamore saplings (3). Generally woody plants are preferable because they provide the most amount of shade for the streams and organisms in the streams, however it is also important to supplement with shrubs and other small herbaceous plants. Woody plants would also provide for a stable base for the stream to prevent any major erosion or channelization. Once the area has been generally restored, it is important to have a group who is able to periodically check up on the progress and health of the stream as well as the surrounding buffer zone to be sure no major issues arise. Some things that could possibly go wrong would be that people continue to mow to the edge of the stream if there are no physical boundaries preventing it or the saplings may not have thrived in their new environment. These are issues that could most likely be fixed quickly as new trees could be planted as well as flyers distributed to remind people not to mow to the edge of the stream. Finding some way to show statistics and the data put into simpler terms, it would be easier to get the point across to many people who are uneducated about streams or their environmental impact. Some may not be interested in the topic, so it would be an interesting step to take the data and find out how much money would be saved from a project like this. Elmore, Wayne, and Robert L. Beschta. "Riparian areas: perceptions in management." Rangelands Archives 9.6 (1987): 260-265. "Riparian Buffers." NC State University Biological and Agricultural Engineering. N.p., n.d. Web. 9 Nov. 2015. http://www.bae.ncsu.edu/programs/extension/wqg/sri/riparian5.pdf. "Understanding the Benefits of Healthy Riparian Areas." Fact Sheet - Extension. N.p., n.d. Web. 9 Nov. 2015. http://ohioline.osu.edu/ls-fact/0001.html. Mecklenburg, Dan. "Forested Buffer Strips." Ohio Department of Natural Resources. N.p., n.d. Web. 14 Dec. 2015. http://soilandwater.ohiodnr.gov/portals/soilwater/pdf/stream/stfs13.pdf . "Stream Restoration and Management." Ohio Department of Natural Resources. N.p., n.d. Web. 15 Dec. 2015. http://soilandwater.ohiodnr.gov/water-conservation/stream-restoration#OVE . "The Meaning of the 1977 Clean Water Act." EPA. N.p., n.d. Web. 15 Dec. 2015.